If you live near trees filled with squirrels, you could get a squirrel in your attic that might start chewing on insulation and electrical wires. In an attempt to get rid of it, you might wonder, “Will squirrels eat rat poison?” There are several bad consequences with that idea. Are you ready to endure the smell of a dead, decaying squirrel in your home after it’s poisoned? Does your state allow squirrels to be poisoned? Are you interested in a better solution to your squirrel problem? Any animal that dies from poisoning suffers a painful and agonizing death, so if you need to kill, administering a sudden and swift death is kinder and more humane to the animal, rather than the torture endured through poisoning. Rat poison is often built with a blood thinner that works slowly in ruining a rodent’s intestines because of how rats feed. It’s made this way because rats often test an unknown food to determine its safety, and then return to eat more, if they think it’s all right. 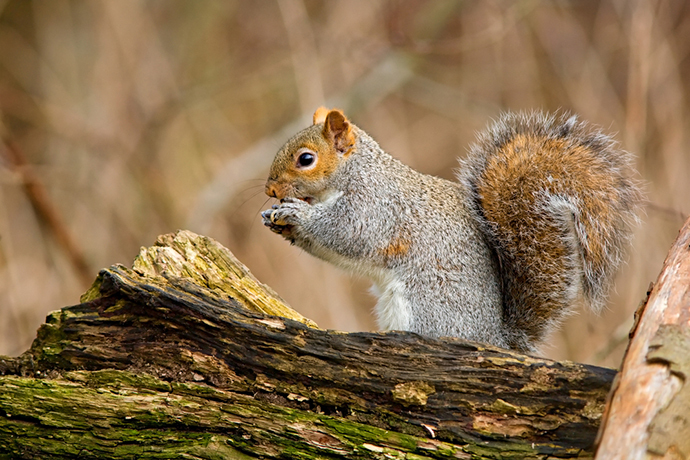 When squirrels are poisoned and are left alone, they rot, emitting a very foul smell unlike any aroma. When you poison a squirrel, or even worse, an entire family of squirrels, and death occurs in your home, you soon will be forced to leave your home due to the smell. In her National Geographic blog entry entitled This Is What Happens When You Use Rat Poison﻿﻿: Flymageddon, Erika Engelhaupt describes the hordes of flies, including large flesh flies, which show up after animals die due to eating rat poison. The other problem with rat poison is that it kills indiscriminately, killing rodents that are often eaten by birds of prey, such as hawks, owls, and eagles, which then die of poisoning, and mammals, like fox, coyote, and raccoons, also die from secondary poisoning. An even worse scenario entails poisoning your pet, or pets owned by neighbors, who eat rat poison left out to be devoured by squirrels, which means arbitrarily distributing rat poison invites any being to eat it, even an infant such as your own child, leading to tragedy. Besides an arbitrary death brought about by rat poison, it’s illegal to poison squirrels in many states; for example, the University of California mentions that it’s not legal to poison tree squirrels in California, and you could face a fine if you’re found to poison squirrels. Other states consider squirrels as game animals, which can only be hunted with a rifle during a specific season, or time of the year. Hunting rules and regulations in all states prohibit the use of poison for taking any small or large game within their borders. Squirrels eat a wide variety of food, but the Massachusetts Division of Fisheries & Wildlife claims that 75 percent of their diet consists of nuts, such as walnuts, beechnuts, hickory nuts, oak acorns, along with flowers, buds, seeds, fruits, and berries. Whole peanuts are the best squirrel bait, read more about that here. Some squirrel varieties, like red squirrels, will eat the cones of conifer trees and tree bark, and on the odd occasion, squirrels are known to eat animal products, such as nestlings, eggs, small animals such as mice, and even cannibalize the young of other squirrels. Rat poison contains an attractant, or food that rats find appetizing, since the poison is often in the form of bait that is usually made sweet. Popular attractants used in rat poison include peanut butter, molasses, fish oil, and even ground meat. Though peanut butter is attractive to squirrels, and to a lesser degree, molasses, the other ingredients of fish oil and ground meat are not appetizing to squirrels, plus rat poisons aren’t registered for killing squirrels because they are made for attracting rats, not squirrels. Now, will a squirrel occasionally eat rat poison? The answer is yes, squirrels, along with a number of other wild creatures, eat and die from rat poison, an item that also leads to increasing numbers of children who are admitted to emergency rooms, due to poisoning. Rather than killing squirrels with rat poison, search the exterior of your home and find where the squirrel is entering the house, and then, use a live trap, such as the OxGord Live Animal Trap, bait it with peanut butter on a saltine cracker, and check the trap daily. Next, catch the squirrel and cover your point of entry with either tin that is tacked over the hole, or with hardware cloth, which is similar to screening, but with wider gaps than a screen. After the squirrel entry point is covered, release your squirrel outside. This squirrel solution doesn’t kill the animal, yet allows you to remove it from your home, fix the reason the squirrel is in the house, and lets you and the squirrel get back to a normal way of life with you in your house and the squirrel in the wild, where it belongs. This YouTube video created by John Wooding, a North Carolina wildlife biologist, outlines several bad do-it-yourself methods of evicting squirrels from your home’s attic, including using rat poison, along with advice to use a live animal trap, such as the trap listed above. If you're going to try your hand at trapping squirrels yourself, be sure to check out the tips in this article. Will squirrels eat rat poison? Yes, they will. Do you want them to eat rat poison and die in your attic? Absolutely not! Determine where the squirrel is entering your home. 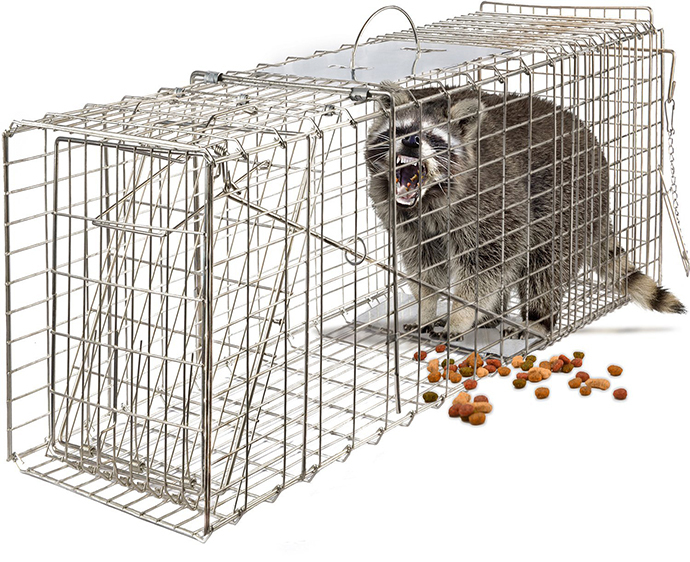 Buy a live trap, such as an OxGord Live Animal Trap, set it, bait it, and check the trap daily. Once the squirrel is trapped, close your entry point, and release the squirrel outside.